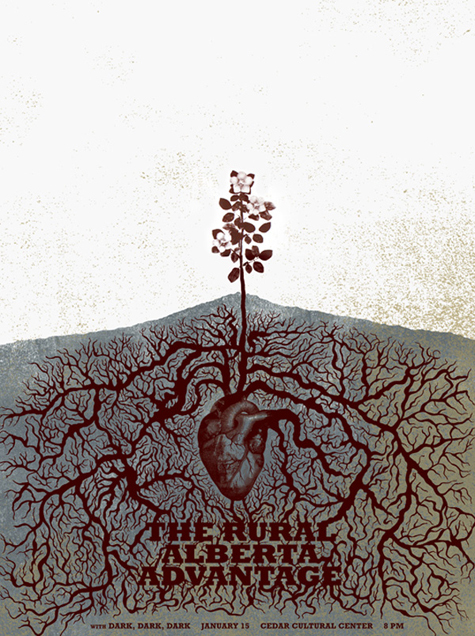 An intriguing poster, designed by Brian Danaher for the band The Rural Alberta Advantage. I like the vascular transition of the heart veins into roots. "This poster was inspired by the band's personal connection with Alberta as well as the content of the lyrics from songs their debut album "Hometowns" (many of which use the word "heart" as a metaphor). The flower depicted is the wild rose, the official flower of the Province of Alberta." I am loving this poster :: there's some great symbolism going on.